Mr. Md. 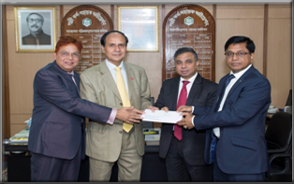 Abdul Karim, the Managing Director of PKSF, handed over a cheque of BDT 5 lac to Mr. Md. Abul Kalam Azad, President of Bangladesh Scouts & Senior Secretary to Hon’ble Prime Minister, Government of the People’s Republic of Bangladesh, as a grant for the 8th National Cub Camporee of Bangladesh Scouts held from December 23-28, 2015 on December 22, 2015. Dr. Md. 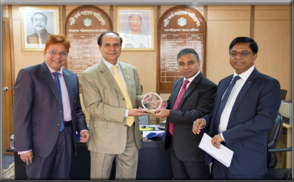 Mozammel Haque Khan, Chief National Commissioner, Bangladesh Scouts & Senior Secretary, Ministry of Home Affairs, and senior officials of PKSF were present on the occasion. Mr. Md. Abdul Karim also presented a PKSF crest as a token of warmth to Mr. Md. Abul Kalam Azad.